There are a lot of bean varieties out there. I tried two storebought varieties (cherokee wax and tongue of fire) which barely produced enough beans to grow next year’s crop. Then I got some of these yardlong beans from family that lives a few hours north in a dry area with loamy (ie sandy) soil. Surprisingly these beans do well in my heavy clay soil also. Yardlong beans are a type of cowpea and are only distantly related to more common bean varieties. The stickless wonder variety are prolific producers. They have not managed to self sow successfully, perhaps because I picked most of them. There have been a few that have popped up and later died. I just plant a few seeds every time I disturb the soil, which is enough to keep me supplied. The photo (top left) shows about one week's production of beans from the two vines I have at the moment. These are watered irregularly. Also shown are some dried beans from last years crop. The seeds are easily separated by rubbing the dried beans between your hands. Yardlong beans are great raw and taste a lot better than supermarket beans – probably because they are fresh. Contrary to what has been reported elsewhere (see wikipedia article below), the really large older ones actually taste better than the slender new ones. They are also great in cooking. Apparently you can use the dried bean seeds as well. I have plenty of these because I couldn’t keep up with the production from only two (well watered) vines and ended up harvesting the dried out beans just for seed, but I haven’t tried cooking with them yet. My neighbours also eat the new shoots of the vines, as does the occasional possum. The name 'stickless wonder' came about because this variety sets the beans from the top of raised stalks. Hence you can let them grow along the ground like pumpkin vines. 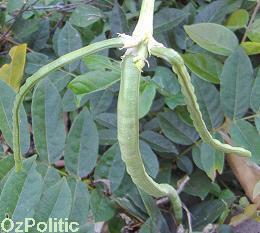 The yardlong bean is also known as the long-podded cowpea, asparagus bean, snake bean, or Chinese long bean. It is known as dau gok in Cantonese, thua fak yao in Thai and kacang panjang in Malay and vali or eeril in [Goa, India]. 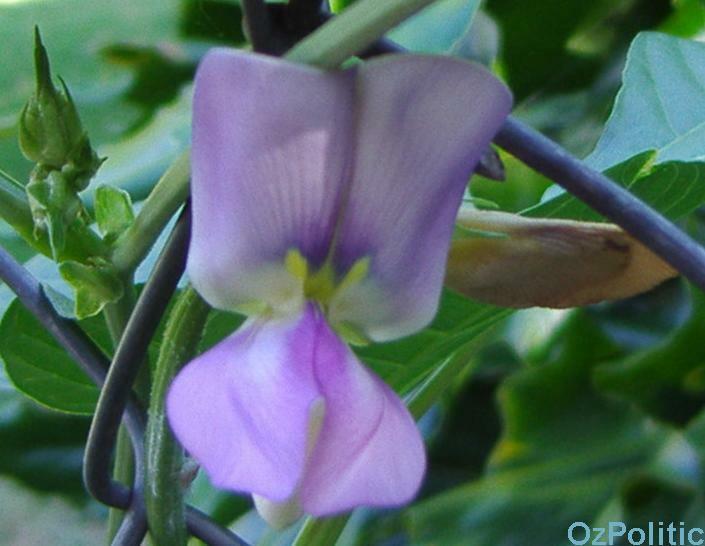 Despite the name, the pods are actually only about half a yard long; the subspecies name sesquipedalis (one-and-a-half-foot-long) is a rather exact approximation of the pods' length. 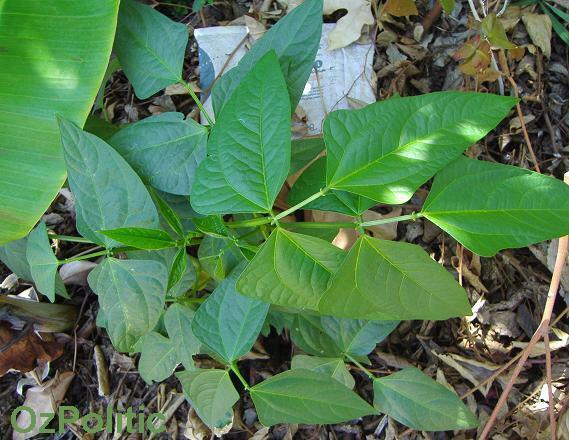 This plant is of a different genus and is only distantly related to the common bean. 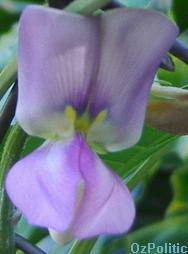 It is a vigorous climbing annual vine. 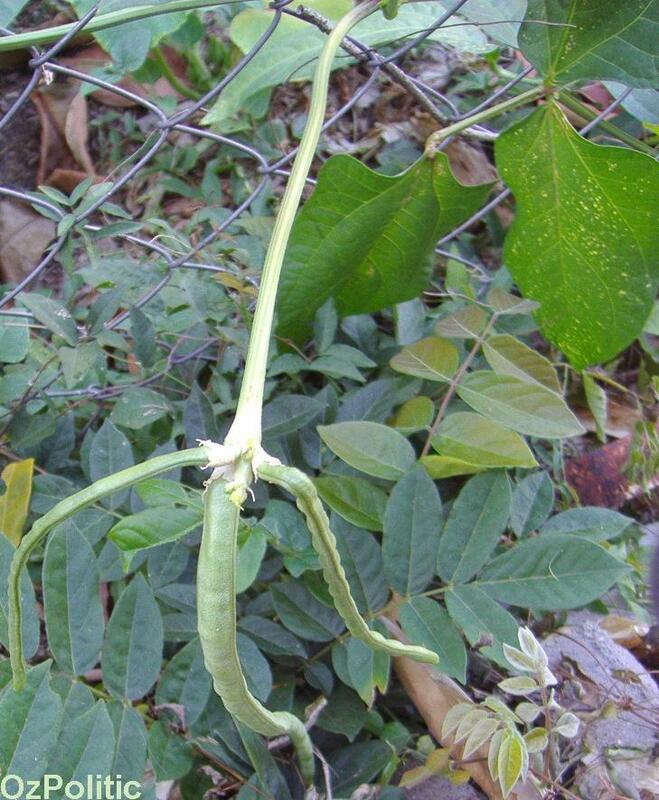 A variety of the cowpea family, it is grown primarily for its strikingly long (35-75 cm) immature pods and has uses very similar to that of a green bean. The pods, which begin to form just 60 days after sowing, hang in pairs. They are best if picked for vegetable use before they reach full maturity. The plant is subtropical/tropical and most widely grown in the warmer parts of Southeastern Asia, Thailand, and Southern China. Yardlong beans are quick-growing and daily checking/harvesting is often a necessity. 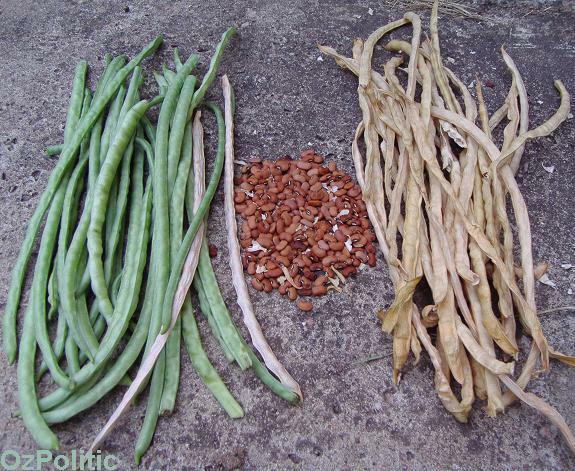 The many varieties of yardlong beans are usually distinguished by the different colours of their mature seeds. The crisp, tender pods are eaten both fresh and cooked. They are at their best when young and slender. They are sometimes cut into short sections for cooking uses. They are used in stirfries in Chinese. In Malaysian cuisine they are often stirfried with chillies and shrimp paste (sambal) or used in cooked salads (kerabu). They are a good source of protein, vitamin A, thiamin, riboflavin, iron, phosphorus, and potassium, and a very good source for vitamin C, folate, magnesium, and manganese.